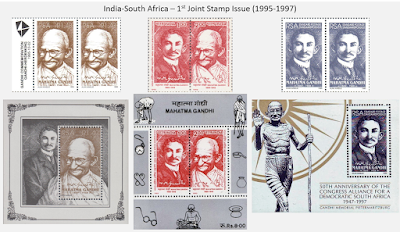 Update (29 Sep 2018): A total of three joint stamp issues have now been issued between India and South Africa, possibly among the most India Post has with any country other than Russia. Two of these were released in June and July this year itself. Two of the three collaborations have also prominently featured Mahatma Gandhi, a key figure in India's freedom movement who spent his formative years in South Africa as a lawyer. The first joint stamp issue was released in 1995, couple of years after South Africa held its democratic elections. The theme for this commemoration was closing of 125th birth anniversary of Mahatma Gandhi. Both countries issued identical stamps, designed by Alan Ainslie and the Indian Post office. The stamps showed Gandhi as young barrister in South Africa and as Mahatma during the 20th century freedom struggle in India. Along with individual stamps, India issued a souvenir sheet containing the se-tenant stamp pair, but South Africa's miniature sheet contained only one stamp. At a later date in June 1997, South Africa issued a second souvenir sheet with the stamp that was not on the first souvenir sheet (see images below). After a gap of 23 years, philatelic cooperation picked up again this year. Since early 2017, the Indian embassy had been planning a joint stamp issue with South Africa and I'd shared some initial plans on Twitter as well. I'd thought a set of 4 stamps showing Deendayal Upadhyaya, Nelson Mandela, Oliver Tambo (all three birth centenaries from 2016-2018) and Mahatma Gandhi (150th birth anniversary) would be issued at once, but there were two separate issues in store. A set of 2 stamps designed by Alka Sharma for India Post was issued in early June during the 125th anniversary of Mahatma Gandhi's Pietermaritzburg Station Incident. 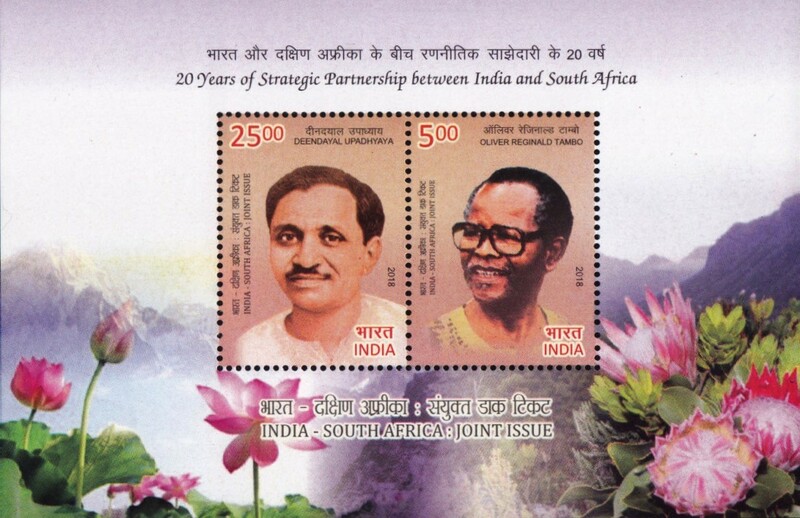 These stamps commemorated 20 years of strategic partnership and 25 years of diplomatic relations, while showing images of Deendayal Upadhyaya and Oliver Tambo on the stamps. Background image in the souvenir sheet shows national flowers of both countries (lotus and protea) along with unknown mountains. Stamps and souvenir sheets for both the countries were printed at SPP Hyderabad, and surprisingly South Africa post office is yet to receive their supplies, almost four months after actual issuance. It is not confirmed, but South Africa will likely only put souvenir sheets for sale and no individual stamps. Deendayal Upadhyaya (1916-1968) was an eminent thinker and political leader of India's right of center ideology post-independence. He espoused the thought of integral humanism and social welfare of poor, downtrodden ('last person in line'). Even though he lived only 50 years, his philosophy left a deep impact on developing a new idea of India. Oliver R. Tambo (1917-1993) was a socio-political leader from South Africa that led African National Congress (ANC), the foremost political organization fighting Apartheid. Tambo started his political journey in 1943 forming the youth wing of ANC. The youth wing had developed new ways of protests and was working in tandem with ANC. Tambo was appointed as the secretary of ANC in 1955, deputy president in 1958. He was then tasked to garner support from other countries and international organizations by traveling abroad. He was then appointed as acting President of ANC in 1967, and president in 1969, a position he held until 1991. For majority of his life in ANC, Tambo was working in exile, but returned to South Africa in 1990, after having spent 30 years out of his home country. He handed over the reigns of ANC to Nelson Mandela, who was eventually also elected as the first President of post-Apartheid South Africa in 1991. The third and most recent stamp set shows Pietermaritzburg train station located near Durban in South Africa. In June 1893, Mahatma Gandhi, then Mohandas K. Gandhi, was removed from a first class train compartment due to his color and asked to moved to end of the train. The young Gandhi did not board the train and spent the night at the station waiting room. This event led to Gandhi fighting for racial equality for Indians in South Africa, eventually giving birth to Satyagraha - the concept of non-violent resistance or holding firmly to the truth using civil resistance. This year is 125th anniversary of the train station incident, and is being commemorated on the identical stamp sheets issued by both the countries. Nelson Mandela (1918-2013) was also a socio-political leader from ANC like Oliver Tambo that led protests and political movement to fight Apartheid in South Africa. He started in the youth wing of ANC in 1944, going on to become its president in 1951. His struggle to abolish Apartheid took shape from 1952 onward, where he devised various plans for defying the minority white government, some actions even turning violent. After several skirmishes and arrests, Mandela was imprisoned at Robben Island from 1964 to 1982. He was transferred to other prisons until his release in February 1990, totaling to 27 years of incarceration. Immediately after release, he begins negotiations with the government to end racial discrimination and establish an equal democracy. He was elected as the first President of democratic South Africa in 1994, a position he held until 1999. Thereafter he immersed in social improvement through his foundation. He continued to remain in public life, until his passing due to ill health in late 2013. Mandela was awarded the Bharat Ratna and Nobel Peace Prize for his work in abolishing Apartheid peacefully and establishing a new democracy in South Africa. It appears that India Post designed the June 2018 stamps (Alka Sharma), and South African artists did the July 2018 issue (Thea Clemon and Alan Ainslie). Nenu Gupta from India is also credited with the July 2018 stamps, but that's likely for adjusting the images and fonts. The basic design likely came from South Africa. These stamps have tried to commemorate so many events and personalities, it's difficult to clearly explain everything. See below for all possible reasons that I think can be cited. Update (07 Jul 2018): I will post details for all the joint stamps issued between India and South Africa here. I've previously shared - on another post and on Twitter - with fellow collectors that the two countries have been working on commemorating several personalities in 2018 and turns out there will be two joint issues in 2018 itself - one each in June and July.